Allows to manage cut racks independently or starting from delivery racks. Can also handle the IG assembling and delivery racks. The results given by our customers revealed that the usage of Perfect Rack will bring an increase in productivity of about 20-25%, while the increase of the scrap is extremely low, below 1%. For an average glassworks company the amortization time is about few months. There are several modes supported by Perfect Rack, to meet all needs. Perfect Rack Cut, integrated in the Perfect Cut optimizer, allows to manage cut racks independently or starting from delivery racks. In this last case you will have the possibility to “fill” racks even adding stacks containing pieces of different families, if these like the already presents ones must be directly delivered or going to insulating glazing without any other departments in the middle. Cut racks can be double or single or harp racks. Perfect Rack Cut optimize the cut and the racks, avoiding any repositioning operations in the racks to reorganize the pieces and bring them in IG assembly or to delivery, saving working time and avoiding scratches and damages to the glass. The usage of this software will decrease installation time and will bring an increase in productivity of about 20-25%, while the increase of the scrap is extremely low, below 1%. 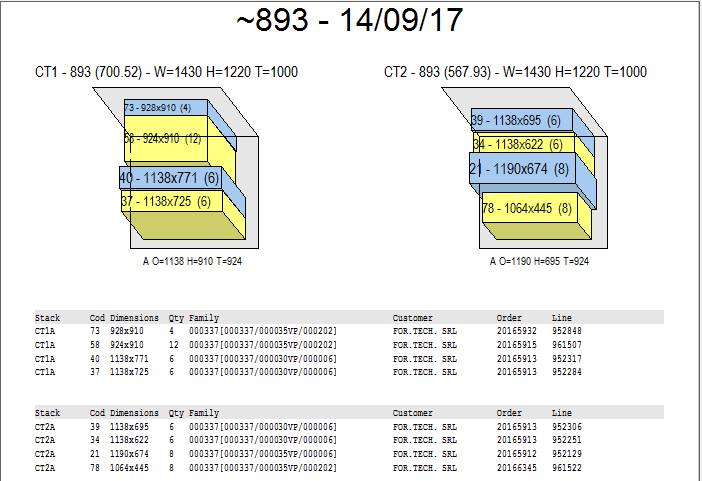 The cut optimization integrated with the racks optimization considers available racks types, specifics parameters of the pieces reallocation on racks and the racks space in cutting area. The optimization’s goal is to obtain an optimal layout sequence so that is not necessary to do any piece reallocation on racks to bring them to IG assembly or to other machinings or to delivery. Obviously this objective can generates a penalization in scrap that must be kept under control. According to a “weight” that the user can set, it’s possible to fix the balance between the obtained scrap and the objective to have all outgoing pieces from the cutting table already sorted. In order to avoid too much penalizing the scrap it might be necessary to “park” some pieces before their last collocation, however the optimizer uses this operation down to the bare minimum. 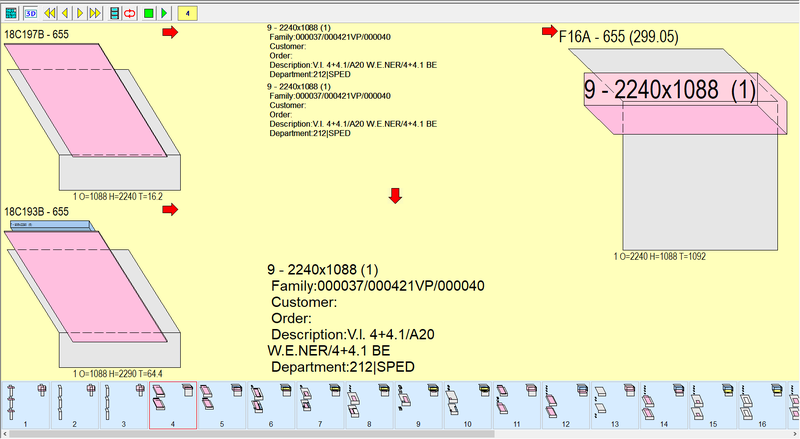 The user can choose which families to optimize or not according to the racks logic. For example, during a period of tight deadlines, the user can choose to optimize all families with this logic; while, during periods of lack of work, simply uncheck the “rack optimization” option to optimize with the minimum scrap logic. In any case the user can find a tradeoff between the needs of obtaining the minimum scrap and well sorted pieces on racks, by changing the “Rack priority weight” in Configuration. A cut optimization project contain single glasses, insulating glasses and laminated glasses. The user can determine whether each family has to be optimized considering the racks, and if it should consider other possibly components to be matched to the rack platform. Now Perfect Cut allows to manage cut racks in mixed mode, that is the ability to insert on cut racks stacks of different families related to the same production lot. The delivery racks generation of production lot will automatically generates cut racks and laminated line racks (for in-house laminated line). This allows to drastically reduce the generated cut racks. 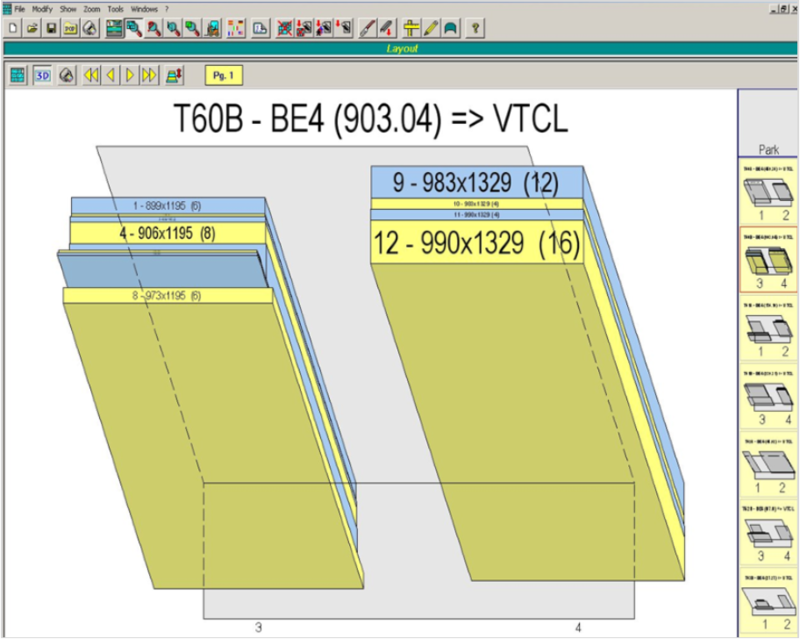 Also Perfect Cut allows to handle manuals cuts to be comunicated to the production software and the creation of the reorder lists for the pieces manually cutted or that are excluded from the racks optimization, to obtain on stacks the pieces in sequence and bring them to the IG assembly without moving them on cut racks. Perfect Rack Harp includes the ability of placement even with glasses of different material, organizing the allocated position in alternate way for each component of pieces composed by many glass families (e.g. F4/12/S33 where F4 goes in a slot and S33 in the next one), resulting ready for the IG assembly. As alternative to this “mixed” mode, it is possible to define the usage of harp racks resulting in a separation between machine types (for example: laminated glass distinct from monolithic) or between families. Perfect Rack Harp, with Perfect Rack Cut, allows simultaneous management of traditional and harp racks, eventually specifying the use of harp racks only when the quantity of pieces to be produced is less than a certain threshold (for example if there are more than 10 pieces of the same dimensions, Perfect Rack automatically chooses the traditional rack instead of the harp). In any case on the layout is shown the position of the piece in the rack, as for standard racks. The usage of the harp racks has advantages and disadvantages. The cutting optimizer is not affected by the racks management, so there is not an increase of the scrap. On the other hand the usage of harp racks causes an increase of the occupied space, slower movements and an higher danger level for workers. Perfect Rack VTC allows to generate the racks coming from IG assembly and going to the delivery considering the maximum quantity of racks that can be located in the IG assambly load or unload area and minimizing the glass movements. By that, the optimal assembly sequence is determinated. All the work flow of the IG assembly is lead without any possibilities of mistake, by a remote visualization of the sequence of the assembly steps that includes the indication of which racks must be used. Perfect Rack Crate allows to manage the allocation of pieces to insert inside the delivery crates. With a given batch of pieces to assemble / delivery and with the maximum weight and deepness of the crate, the system allows to optimize the allocation of pieces inside the crates, providing the crates dimensions, and for each one the list of the contained pieces, in order to fill the containers in the best way.